Before the Sartorialist, before Garance Dore there was, and is Bill Cunningham. 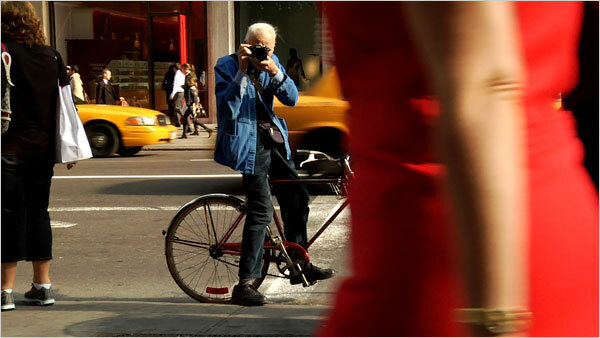 For those of you who don't know Bill and his amazing eye for detail, Bill rides around New York City on his Schwinn taking pictures of stylish people on the street for the New York Times. He is the nicest, most down to earth, shy away from the limelight kind of guy. Ask Bill about himself and he will say he is not a photographer but a record keeper. It is all about the work for him. His work includes pictures of every exhibit Diana Vreeland curated at the Met. He has an incredible breadth of knowledge about the history of fashion and especially the visual history of NY over the last 50 years. He started out as a hat designer in the early 50's and and then was asked by John Fairchild to come write for Women's Wear Daily a few years later. He wrote for Details and has been at the Times since the early 70's. He was one of the first journalists to report Azzedine Alaia and Jean- Paul Gaultier to the American audiences.
" the main thing I love about street photography is that you find answers you don't see at the fashion shows. You find information for readers so they can visualize themselves". "This was something I realized early on: If you just cover the designers in the shows, that's only one facet. You also need the street and the evening hours. If you cover the three things, you have a full picture of what people are wearing". So one of the reasons I am telling you all this is because last night at the New Directors/ New Films festival Bill Cunningham New York directed by Richard Press debuted. The tickets sold out in a flash so unfortunately I couldn't go to the opening night. I can't wait to see this film, hopefully it will be in theaters soon, if it plays near you run out to see it- you won't be disappointed. "I never go out with a preconceived idea I let the street speak to me". images from "Bill Cunningham New York"